I actually took exception to the ‘ugly’ in the Ugly Sweater Contest. 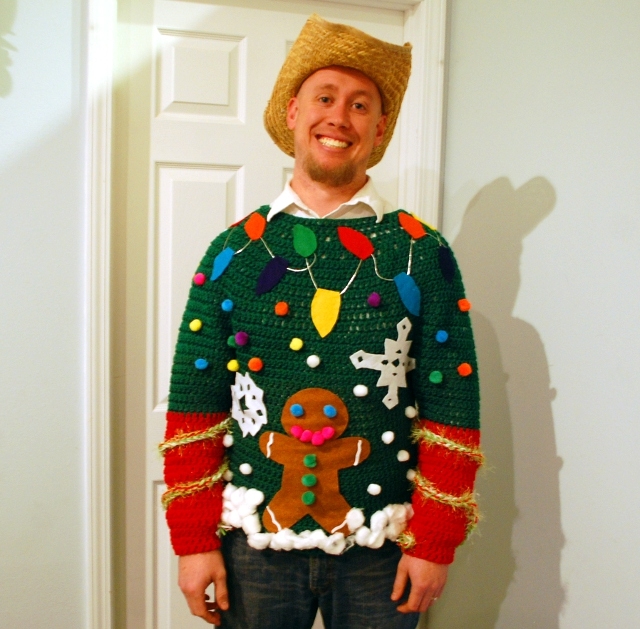 The point of an ugly sweater contest is not to have a sweater that is ugly, but one that is so unrestrainedly, over-the-top crazy Christmas fantastic that it defies logic or rational explanation. Obviously, once you have the basic sweater you can decorate with whatever you have on hand, but this is what I used. My gauge was 9 sts/ 6 rows = 4″ in dc. Rnd 1: Ch 60, join to form loop. Ch 2, dc in each ch around. (60 dc) Join. Rnd 2: Ch 2. Dc in each dc around. (60 dc) Join. Rnd 3: Ch 2. *Dc in each of the next 2 dc, ch 1. Repeat from * around. (90 sts) Join. Rnd 4: Ch 2. Dc in each dc and ch-sp around. (90 dc) Join. Rnd 5: Ch 2. *Dc in each of the next 3 dc, ch 1. Repeat from * around. (120 sts) Join. Rnd 6: Ch 2. Dc in each dc and ch-sp around. (120 dc) Join. Rnds 7-12: Ch 2. Dc in each dc around. (120 dc) Join. Rnd 13: Ch 2. *Dc in each of the next 3 dc, dc inc in next st. Repeat from * around. (150 dc) Join. Rnds 14-18: Ch 2. Dc in each dc around. (150 dc) Join. Rnds 20-36 or desired length: Ch 2, dc in each dc around. Join. Rnd 19: Ch 2. Dc around, evenly spacing 4 decreases. (29 dc) Join. Rnd 20: Ch 2. Dc around, evenly spacing 4 decreases. (25 dc) Join. Rnd 21: Ch 2. Dc around, evenly spacing 4 decreases. (21 dc) Join. Rnd 22: Ch 1. Sc in each st around. (21 sc) Join, finish off. To tack-ify your sweater, use your imagination! My boys and I wound silver cord all the way around the yoke and cut multi-colored lights out of felt. We used the glue gun to attach them and hold the cord in place. Then we glued on felt snowflakes and our felt gingerbread man, with pompoms for ‘ornaments’ and smaller snowflakes as well as the features on the gingerbread man. We glued on cotton balls for the snow, but I think some quilt batting would have held up better. For the ‘garland’ on the sleeves I held three strands of yarn (including some green Fun Fur) together and made a chain with my biggest hook. Then, a little hot glue had it stuck on in no time. Hi i am from Ireland. Just wondering if i could use double knit wool for this sweater. I am so confused over the name worsted weight i don’t understand worsted weight. Thank You. Hi, Diana! Double knit is slightly lighter than worsted weight. Since the pattern is adjustable, you should be able to make it work. Just be aware that if you follow the directions as written yours will probably come out smaller than mine did. Grand thank you. I came across Aran type that might be similar to worsted weight. Hoping to start on it soon, am making it for a nephew of mine. Will show you a picture when i have it done and let you know how i get on. Thank you ever so much for getting back. Could I by any chance buy this? Sorry, we’re building a stash. 😀 We’ve had friends borrow it (and version 2) for parties! I would like to attempt to make this sweater but I’m an extra large woman and I think the sizing might be a little small for me. How do I determine the number of stitches for my beginning chain if I want like a man’s XL or a woman’s 2XL. Plus I like my sweaters a little big (I don’t want it to be too tight). Thank you, Doreen. Hi, Doreen! The good news is that this is a top-down sweater, so it’s try-on-as-you-go. The beginning chain is the neck, so try it out! It might be the right size for you. To increase the chest circumference, try it on at about rnd 14 and see how much more room you need. Measure how many stitches you need to add that much more fabric, then add those increases in the next row. You can either space them evenly (for bigger all around) or space them evenly across one half of the round (for just bigger in the front). Then you’re going to have to try it on as you determine how many stitches to reserve for armholes, how many to leave as body, etc. My advice is that if you’re adding bust shaping, be sure to mark which side of the sweater it is! I love this pattern!! One question, I ‘need’ to crochet a sweater like this for a friend, he wears a 3X tho. Is there an easy way to make the pattern do that size? Thanks for your beautiful work! Best ‘ugly’ Christmas sweater I’ve seen! !